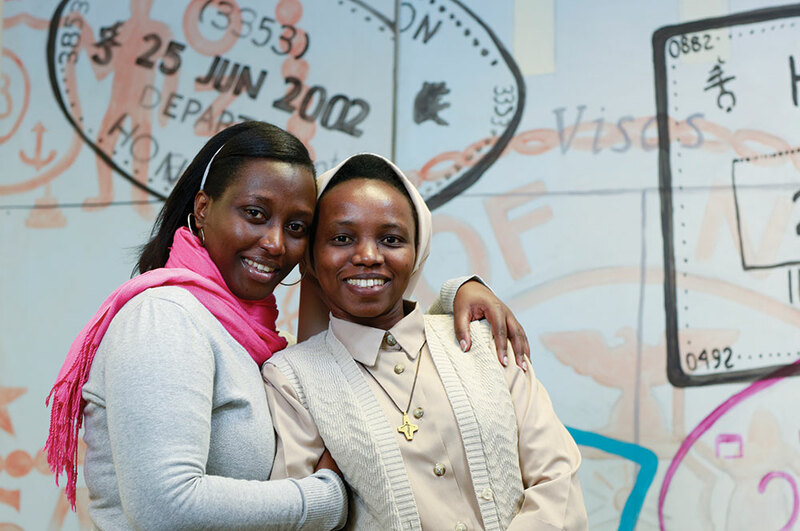 They may be separated by more than 8,000 miles, but TCU and Rwanda are growing closer every day. Kurk Gayle, director of TCU’s Intensive English Program (IEP), says the ties that stretch from campus to the east-central African nation, go back many years and involve people from all over campus. In 2011, Sherrie Reynolds, professor of education, profiled the work of nuns in the country in her book, The Arms of God: Sisters of Saint Mary Namur, Western Province. In the book, the sisters tell of the post-genocide need for English instruction. After the 1994 genocide, English became one of the African nation’s official languages. Reynolds and Bonnie Melhart, associate provost of academic affairs and dean of university programs, approached Gayle to see if TCU’s Intensive English Program could help some of the Rwandan sisters as they prepared to teach classes in English. As a result, Sister Esperance, a native of Rwanda and principal of a primary school run by the Sisters of St. Mary, came to campus in October as a scholarship-funded student learning English. In 2012, Gayle received approval from Melhart and Provost Nowell Donovan to use IEP funds for the first TCU scholarship to bring a Rwandan student to campus for the 2012-2013 academic year. The Rwanda Advisory Committee of faculty and staff was formed to help select the first scholarship recipient and ensure the scholarship continues. A second student committee also was formed to help support to the scholarship recipient. Yannick Tona of Kigali was selected as the first recipient of the scholarship, now called the Carl and Teresa Wilkens Scholarship. The award was named after American Carl Wilkens, who stayed in Rwanda during the genocide to bring food, water and medicine to orphans including many who were in hiding. After a year in the program, Tona was offered a full-tuition scholarship to TCU. He’s now a freshman political science major and is chief executive officer of Global Youth Initiative at TCU and vice president of Frog Talks, which helps organize events similar to TED Talks. The TCU Rwanda Advisory Committee selected Yvonne Umugwaneza as the recipient of the 2013-2014 Carl and Teresa Wilkens scholarship. Umugwaneza worked as a press officer at the Kigali Genocide Memorial and since coming to campus, she has visited classes to discuss Rwanda, the genocide and the reconciliation. This spring, Deo Mahanga, a Kigali native who is now a permanent resident in Fort Worth, became the fourth Rwandan Horned Frog. A student in Intensive English, his goal is to eventually enter the Neeley School MBA program. Umugwaneza says she has enjoyed her time in Texas including outings to TCU football games and the Fort Worth Stock Show. She’s grateful to have had the opportunity to become part of the Frog family. “TCU is like a family, like a home,” she says. “I’ve learned so much here and I’ve been able to really challenge myself. As a child in Rwanda, Yannick Tona survived genocide to become a tireless promoter of tolerance and cross-cultural understanding.